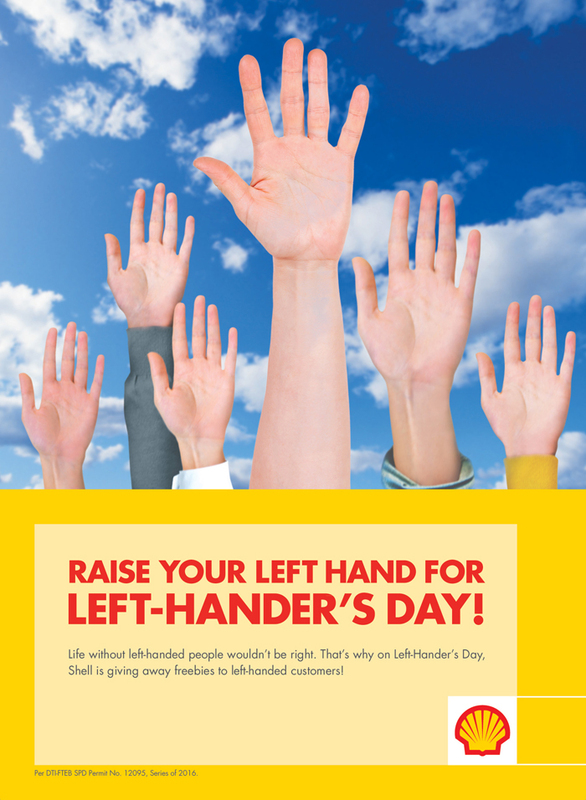 Happy International Left-Hander’s Day from SHELL! The other day, a few bloggers and I were invited by Shell for a special video shoot to celebrate left-handed customers all over the country. We had no idea what challenges we were meant to do or what the video was about. Well, now we know! And today, you'll know too. They will be releasing the video today! Anyway, we had so much fun doing it. Bonus pa that I did it with 2 of the Clingies. For now, all I can say is-- Salute to all you left-handed people! You are unique, beautiful & awesome. :) Photos! The 3 of us were asked to take our places in front of the camera and do 4 left-hand challenges. Exciting! First was the ice cream scooping challenge. It was pretty easy since the ice cream had already melted so it's softer. Easy peasy! Hihi. Second was the handwriting challenge. We were asked to choose phrases or sentences and then write the words on paper using our left hand. Ever since I read somewhere that left-handed people are more intelligent than right-handed people, I pushed myself to practice using my left hand when writing. Been doing this for years. So this challenge was pretty easy for me, too. Naks yabang. But for serious, it becomes tiring when I write longer words. Haha. Ana's work! Sha lang nagpic ng lahat ng challenges haha. Fourth was the hardest of them all! We were all given a laptop and our task was to draw (and fully shade) 4 different shapes using MS Paint. Mejo nag cramps kamay ko dito. Haha. It was super difficult because drawing on MS Paint is quite technical. Took us a while to finish everything. Haha! I was able to draw a few more extra shapes though bilang I wanted to perfect it. Wow. Hehe. This whole experience made us realize how special & unique lefties are. I wish I was one! Haha. My boyfriend Nico is a leftie so I immediately texted him to let him know he belongs to the unique 10% of the world population AND he's in line with famous people like Oprah, Obama, Bill Gates, Mark Zuckerberg, Steve Jobs, etc. Bongga! Tuwang tuwa sha. Feel na feel niya na hi being leftie now. Hihi. Shell recognizes everyone's uniqueness & individuality, so on International Left-hander’s Day, Pilipinas Shell is giving away a unique gift to left-handed motorists that they could use every day. 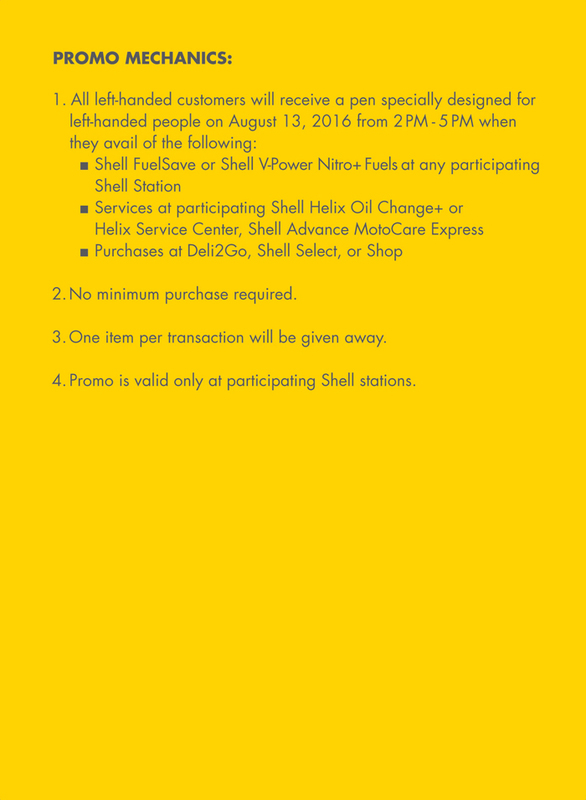 This coming August 13, left-handed customers who will drop by from 2 p.m. to 5 p.m. at any of the 60 participating Shell stations nationwide will be treated to an ergonomically-designed pen that will help them write easier and more comfortably. Today, we celebrate you. :) Happy International Left-Handers Day!